The Yamaha WRs of recent years have come fairly well corked up from the factory. I rode the machine around for a few weeks during break in while it was corked up. It's rideable in that configuration, however it feels like an air cooled XR250 with a really light flywheel. And it feels like it only revs to 6 grand. I couldn't wait to get it uncorked. I wish Yamaha would see fit to release multi state versions so we wouldn't have to uncork them. Plugging up the exhaust, limiting throttle travel and restricting airbox flow as well as including some kind of smog pump are measures Yamaha has taken to make this bike is green sticker legal. Alrighty then.. let's release the hounds. You'll need the GYT-R kit for your year WR. One thing I really miss on dirt bikes is a nice thin steal frame. 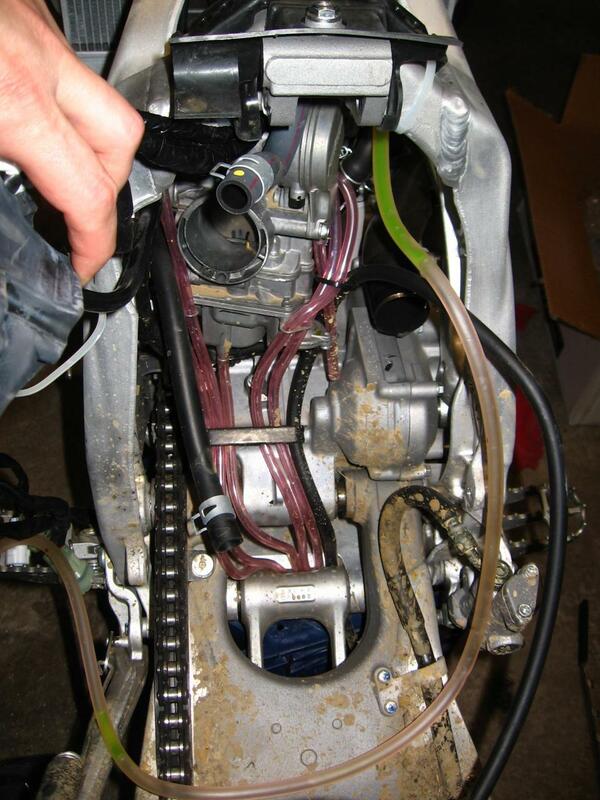 To get to the carb on the WR with it's chunky aluminum frame, you have to remove the rear subframe and rear shock. I tried it without doing those steps, and it's not gonna happen without breaking stuff. So, be prepared for a fairly major project. Removing the subframe is relatively easy. 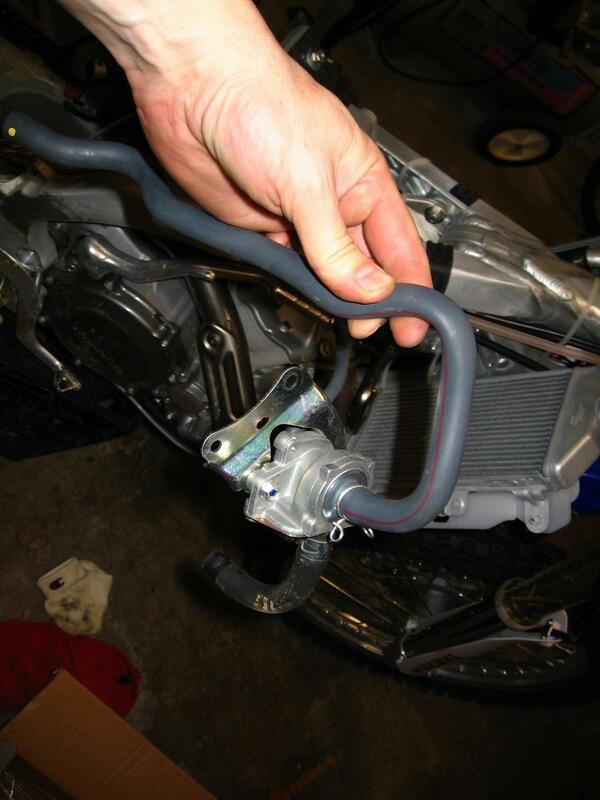 Make sure to note the routing of the radiator overflow tube. I'm still not sure I've got it back on right... but it works. Remove the seat, then the battery. Always remove the negative terminal first. 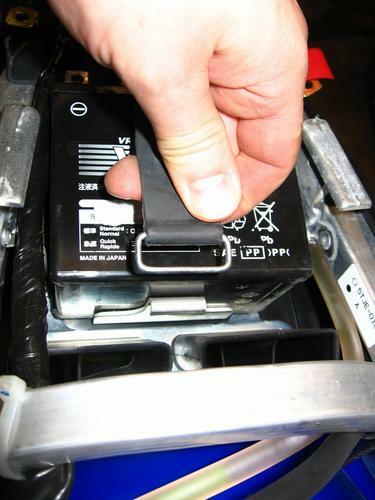 Pull the strappy thing off the battery once the cables are removed. Make sure not to lose the nuts from the battery terminals. 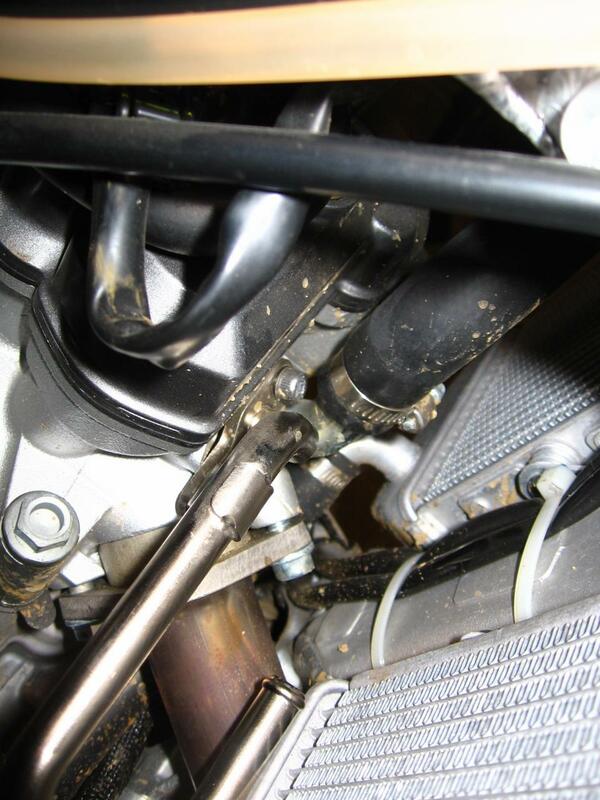 Loosen the rear exhaust clamp. 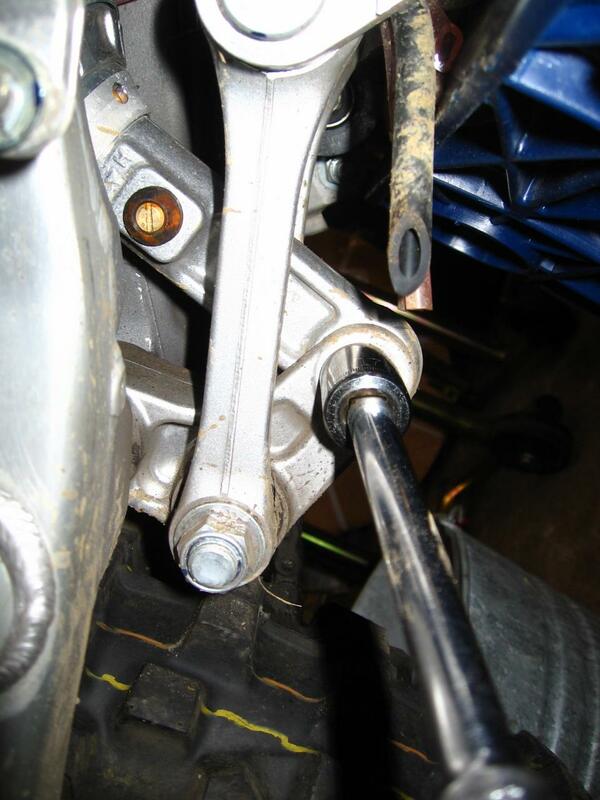 Remove the lower subframe bolts. Remove the upper subframe bolt. Loosen the boot from the carb. Remove the breather hose from the airbox. Unplug the mess of wiring behind the left sidecover. 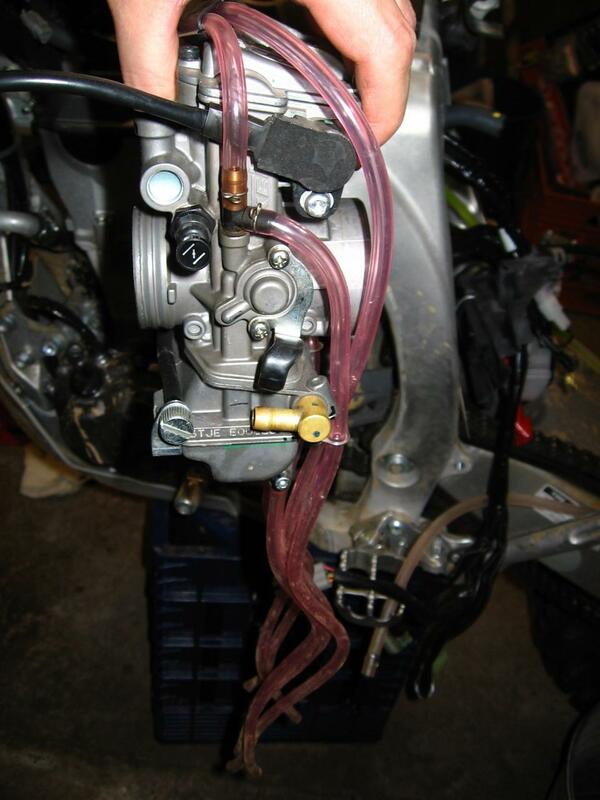 Unplug the coolant tank overflow. Unplug the radiator overflow tube. 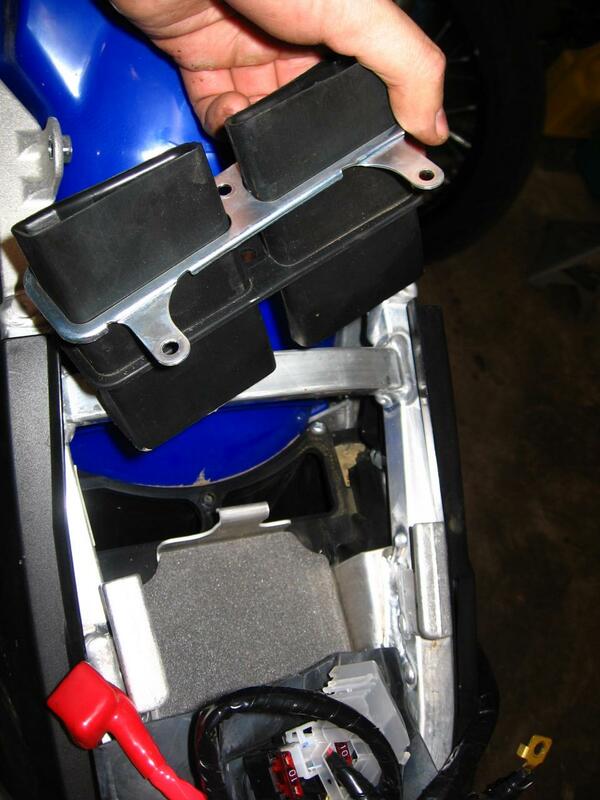 Now you should be able to remove the subframe. You'll be able to see this view of the carb from the rear. 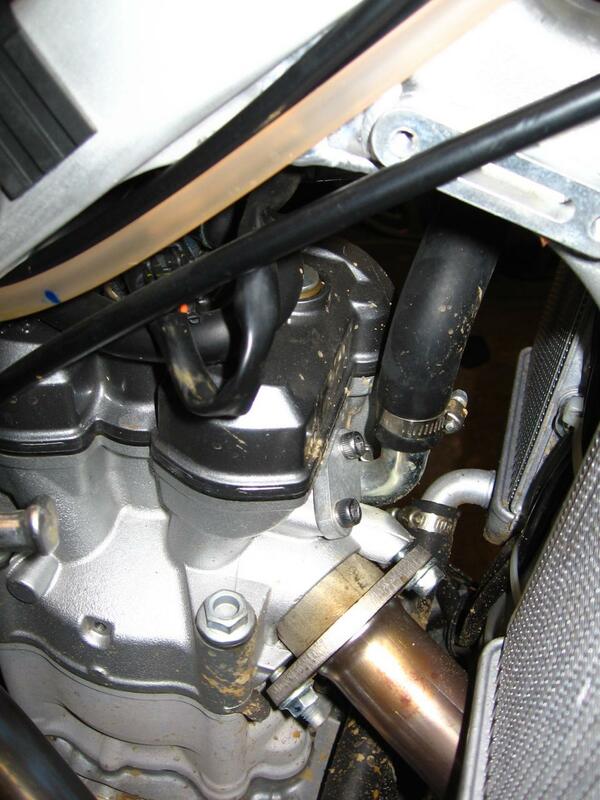 Note that I've got the throttle opened as wide as it will go with the stock throttle stop in place. Kinda pathetic that it's that corked up. I went ahead and removed the fuel tank at this point since i was putting a dual sport kit on it. I'll cover that in another article. Removing the tank made access to the carb easier. I recommend it. Make sure the fuel petcock is turned off and remove the fuel line from the carb. Remove the rear shock upper mounting bolt. You should now be greeted by a clean shot at the carb and all it's tentacalized pink glory. 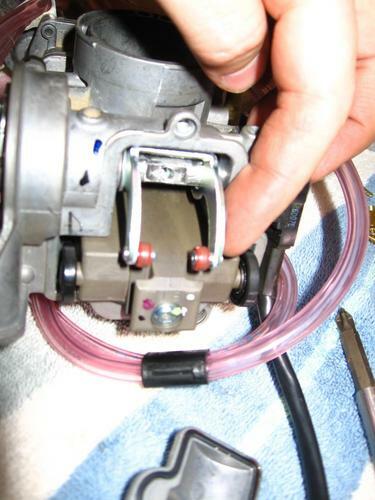 Loosen the front carb boot clamp. Then remove the cover from the throttle cable assembly on the upper side of the carb. Loosen the lower throttle cable housing nuts and pull the cable out. Then unthread the upper cable and pull it out. 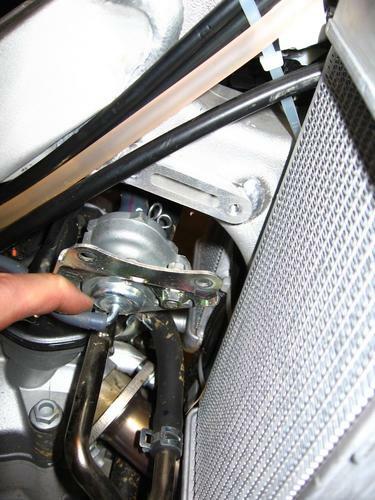 Unplug the TPS (throttle position sensor) cable. Make a note.. some people do not plug the TPS back in when assembling. It does provide for a smoother steady state crusing speed by curing a surge inherent in the WR. However, it causes the ignition curve to run on the wide open part of the ignition curve map. This could decrease mid and low end responsiveness and increase potential for stalls when idling around in the woods. I personally only find the surging annoying when crusing at a steady road speed. I've left mine connected. Oooohh look.. magnesium..
Unscrew the hot start cable and remove it from the assembly. 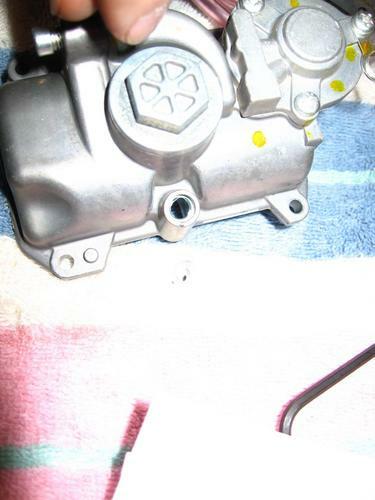 Wrestle the carb out of it's home.. Behold, the WR intake. 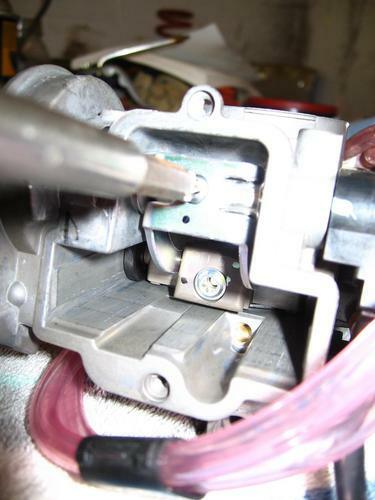 See those valve stems? You don't want anything getting in there. Stuff a nice clean rag in there. This is the offending throttle stop.. remove it. And replace it with the one that came with your gyt-r kit. Remove the cover from the flat slide. Remove the screw from the flat slide linkage. Thus allowing the linkage to rotate far enough to remove the slide itself. Replace the needle with the one included from the kit. I installed mine 4th from the top as recommended by the kit. Reassemble the slide and then remove the float bowl. 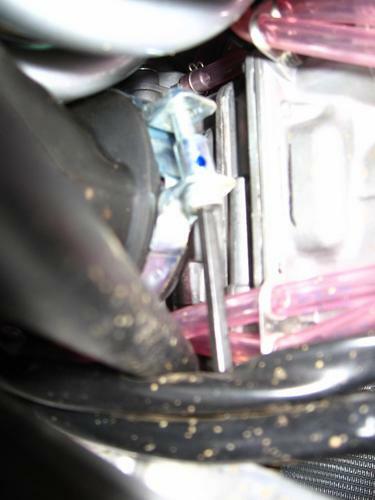 Either drill.. or insert a screw into the idle air adjust screw hole and pop the cap out of it. It's the cap with the tiny hole and the black dot in this picture. 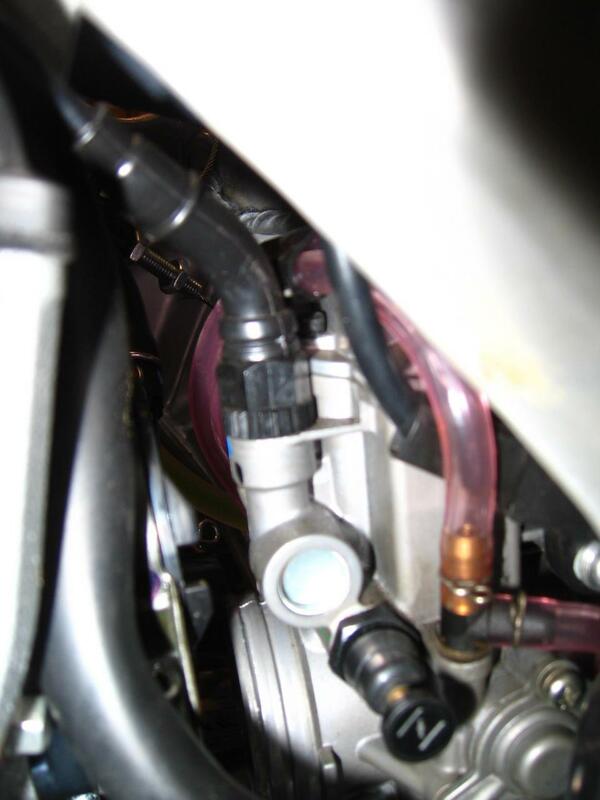 Then replace this leak jet with the one that came from the kit. 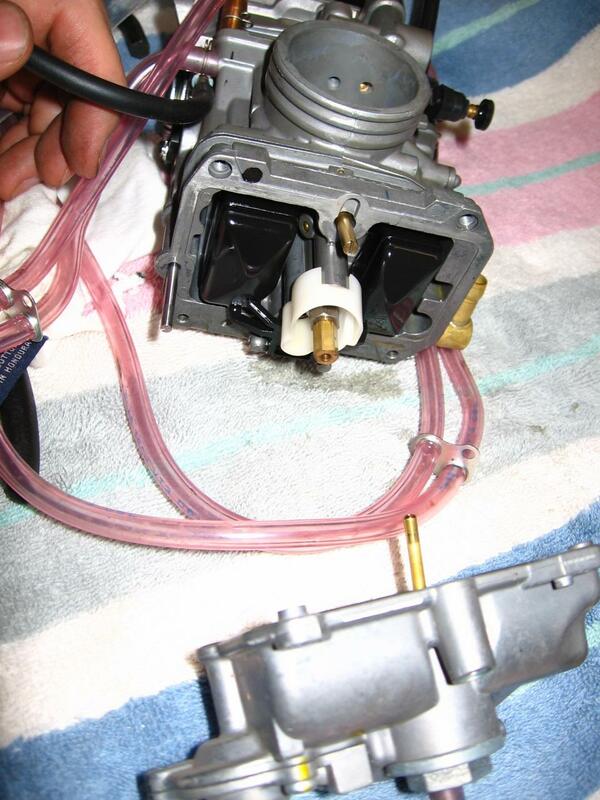 Also, replace the main and idle jets on the carb body. There is a main airjet that gets installed here. 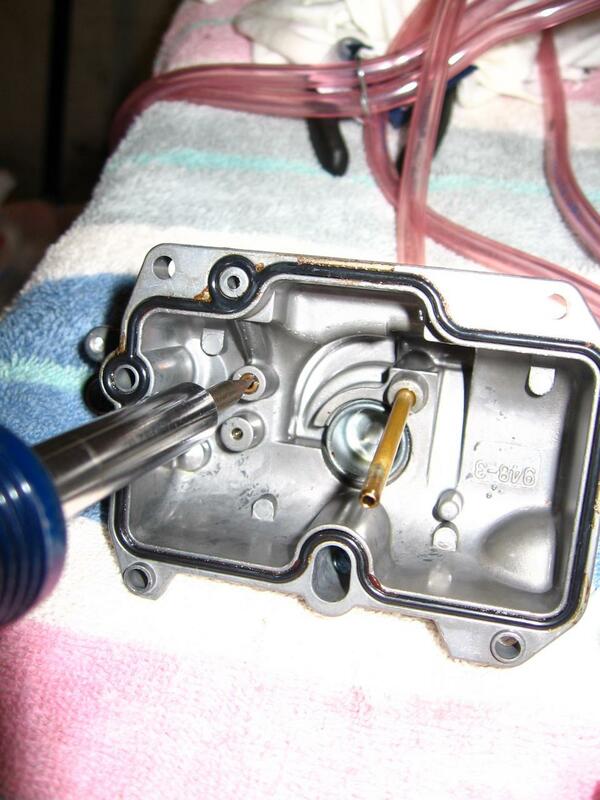 reassemble the carb and adjust the fuel mixture screw to 2 turns out from lightly seated. Next we'll remove the AIS. Remove this hose from the right rear of the engine and plug the hole with the supplied cap. Remove this whole assembly and the hoses connected to it. Next remove the stainless steel section of the pipe and block off the hole in the engine with the supplied block off plate. 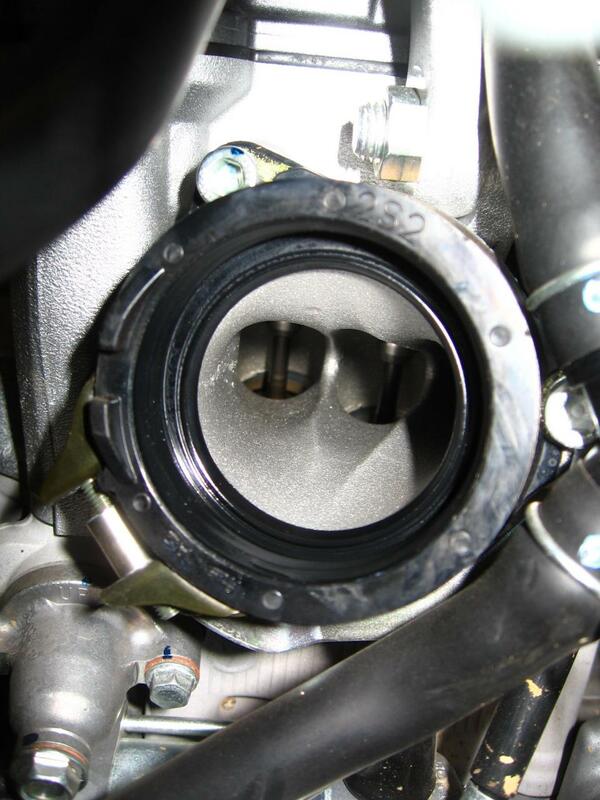 Remove the airbox intake silencer. Remove the cover over the exhaust tip. 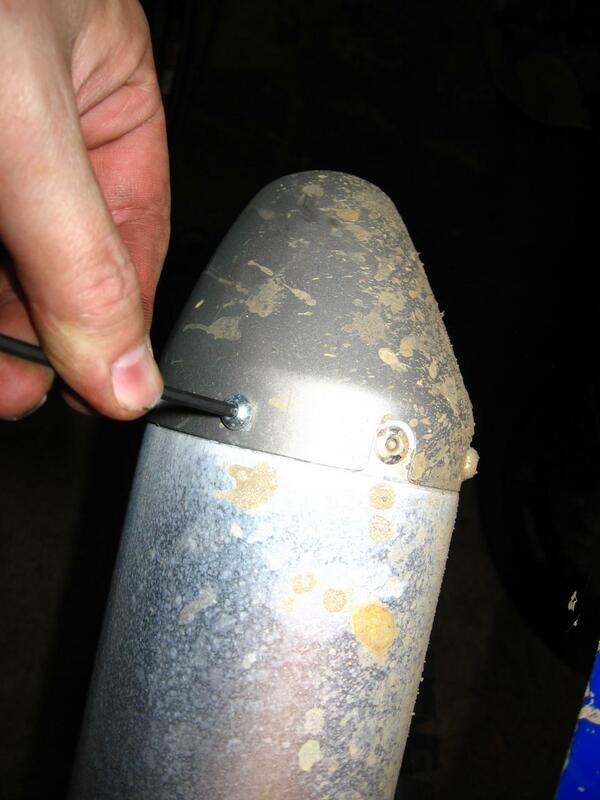 Remove the tip itself and knock out the small interior baffle by using a drill to cut through the spot welds holding it in. Or, do as I did and just purchase the performance tip to replace the stocker with. 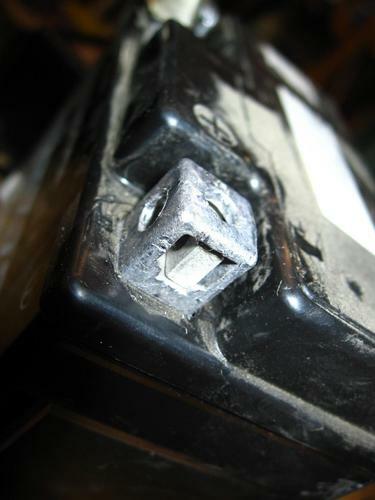 There is a grey wire that can be removed from the cdi connector. It can just be seen in this picture. It needs to be pulled out of the connector and tied back and insulated so it won't touch ground. This connector will cause the cdi to use a more aggressive timing curve. Some people leave this in, or will plug it back in if they are going to ride in slick conditions in order to have a more tractable power band that hits easier. That's it.. reassembly is the reverse of disassembly. The kit really does wake the bike up. The settings recommended by the kit seem to be good for my riding area. I've seen many people blaming Yamaha for corking up the bikes. It's not Yamaha's fault. Put the blame on the various governments that control noise and emissions. They're the ones that require certain standards to be met. Yamaha has two choices when it comes to this. 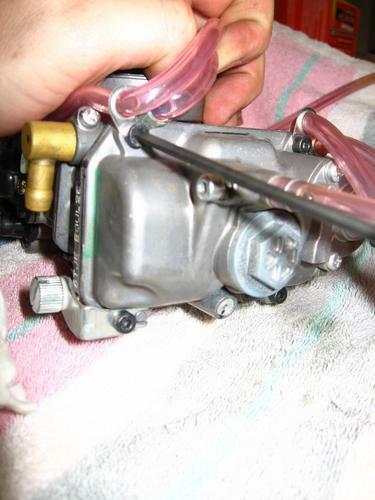 They can do what they did and limit the throttle, mixture and exhaust to comply. Or, they can spend oodles of dollars in ways to boost performance to work within the restrictions mandated. Personally, I'd rather pay for a cheaper product and modify it myself, instead of paying top dollar for something that meets some random emissions requirement. Also, according to some "wood ducks" (whatever the hell that means) in Australia, I've shown you the wrong way to do this. So, if you live upside down and don't trust your counterparts in the northern hemisphere, then please disregard everything you've read here. Apparently Australians have a better way to do stuff. These are great instructions. I have an 09 wr450 and am about to install the gytr ais kit as well. I know you said that the kit works well for your area. I just wanted to find out at what altitudes you generally ride. I'm in colorado and typically ride from 4000 to 8000 feet. I just want to make sure my jetting will work well. Currently running a 165 main and all others are stock. Thanks again as this is very helpful. I usually ride between 1000' and 3500'. I'm trying to remember what main jet the kit came with... I think it was a 175. I think the stock was a 162. I think for 4000' to 8000' range uncorked I'd try a 172 main. Maybe a 48 pilot jet.. The stock is 45. I think the kit comes with a 50. And then for the leak jet try a 55.. the kit comes with a 60. The air jet in the kit was a 110, but I don't know what the stock size was so maybe start with a 110. As far as needle height.. 4th from the top might work.. but I might be tempted to try 3rd. You may find the jets in the GYTR kit will work just fine at the lower range of your elevation, but I'm guessing towards 8000' it'll be a little bit rich. I can't say for sure the sizes I picked will be perfect, but that's where I'd start if I were in your place. Good luck! 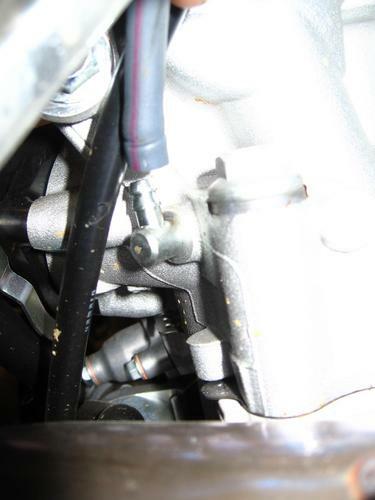 And if you nail down the jetting let me know what works! The dealer told me they jetted to a 165 however when I pulled it out it was a 158 (way too lean). I put a 165 jet in and used a J.D. red needle on the 3rd position. Fuel screw 1 1/2 turns out. Seems to be running great and I notice a lot more snap on the 1/2-full throttle. Also, much snappier on the low end (J.D. kit includes o-ring to install on Fuel accelerator screw for more snap on the lower end). Bike starts and restarts much quicker too. I didn't bother with the pilot or leak jet yet. AIS removal also completed. Thanks again as these are the most detailed instructions online and I would not have been able to do this without them.